According to Children’s research presented during the Institute for Healthcare Improvement 2018 Scientific Symposium, standardizing feeding practices – including the timing for fortifying breast milk and formula with essential elements like zinc and protein – improves growth trends for the tiniest preterm infants. About 1 in 10 infants is born before 37 weeks gestation. These premature babies have a variety of increased health risks, including deadly infections and poor lung function. Emerging research suggests that getting their length and weight back on track could help. According to Children’s research presented during the Institute for Healthcare Improvement 2018 Scientific Symposium, standardizing feeding practices – including the timing for fortifying breast milk and formula with essential elements like zinc and protein – improves growth trends for the tiniest preterm infants. The quality-improvement project at Children’s National Health System targeted very low birth weight infants, who weigh less than 3.3 pounds (1,500 grams) at birth. These fragile infants are born well before their internal organs, lungs, brain or their digestive systems have fully developed and are at high risk for ongoing nutritional challenges, health conditions like necrotizing enterocolitis (NEC) and overall poor development. 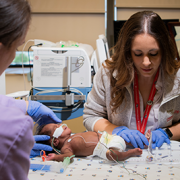 The research team measured progress by tracking the micro-preemies’ mean delta weight Z-score for weight gain, which measures nutritional status. Providing a decision aid about feeding intolerance. Dietitians were included in the daily rounds, during which the multidisciplinary team discusses each infant’s care plan at their room, and used traffic light colors to describe how micro-preemies were progressing with their nutritional goals. It’s common for these newborns to lose weight in the first few days of life. Infants in the “green” zone had regained their birth weight by day 14 of life and possible interventions included adjusting how many calories and protein they consumed daily to reflect their new weight. Infants in the “yellow” zone between day 15 to 18 of life remained lighter than what they weighed at birth and were trending toward lower delta Z-scores. In addition to assessing the infant’s risk factors, the team could increase calories consumed per day and add fortification, among other possible interventions. Infants in the “red” zone remained below their birth weight after day 19 of life and recorded depressed delta Z-scores. These infants saw the most intensive interventions, which could include conversations with the neonatologist and R.N. to discuss strategies to reverse the infant’s failure to grow. Future research will explore how the nutritional interventions impact newborns with NEC, a condition characterized by death of tissue in the intestine. These infants face significant challenges gaining length and weight. Caitlin Forsythe, MS, BSN, RNC-NIC, NICU clinical program coordinator, Neonatology, and lead author; Michelande Ridoré, MS, NICU quality-improvement program lead; Victoria Catalano Snelgrove, RDN, LD, CNSC, CLC, pediatric clinical dietitian; Rebecca Vander Veer, RD, LD, CNSC, CLC, pediatric clinical dietitian; Erin Fauer, RDN, LD, CNSC, CLC, pediatric clinical dietitian; Judith Campbell, RNC, IBCLC, NICU lactation consultant; Eresha Bluth, MHA, project administrator; Anna Penn, M.D., Ph.D., neonatologist; Lamia Soghier, M.D., MEd, Medical Unit Director, Neonatal Intensive Care Unit; and Mary Revenis, M.D., NICU medical lead on nutrition and senior author; all of Children’s National Health System. 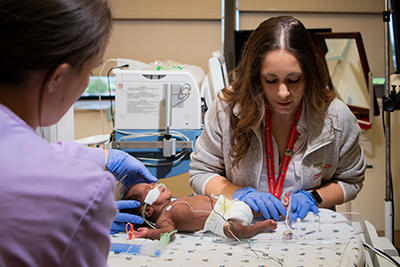 Tory Peitz, R.N., (left) and Victoria Catalano, RDN, LD, CNSC, CLC, (right) Pediatric Dietitian Specialist in the Neonatal Intensive Care Unit at Children’s National Health System, measure the length of a micro preemie who weighed 1.5 pounds at birth. 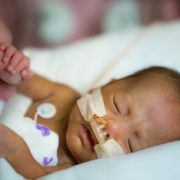 A quality-improvement project to standardize feeding practices for micro preemies – preterm infants born months before their due date – helped to boost their weight and nearly quadrupled the frequency of lactation consultations ordered in the neonatal intensive care unit (NICU), a multidisciplinary team from Children’s National Health System finds. According to the Centers for Disease Control and Prevention, about 1 in 10 infants in 2016 was preterm, born prior to completing 37 gestational weeks of pregnancy. 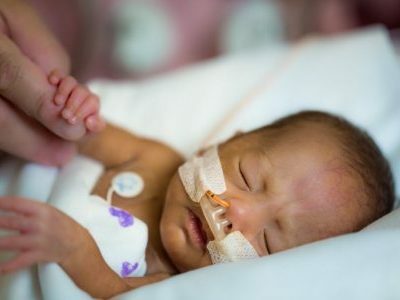 Micro preemies are the tiniest infants in that group, weighing less than 1,500 grams and born well before their brain, lungs and organs like the liver are fully developed. As staff reviewed charts for very low birth weight preterm infants admitted to Children’s NICU, they found dramatic variation in nutritional practices among clinicians and a mean decline in delta weight Z-scores, a more sensitive way to monitor infants’ weight gain along growth percentiles for their gestational age. A multidisciplinary team that included dietitians, nurses, neonatologists, a lactation consultant and a quality-improvement leader evaluated nutrition practices and determined key drivers for improving nutrition status. “We tested a variety of strategies, including standardizing feeding practices; maximizing intended delivery of feeds; tracking adequacy of calorie, protein and micronutrient intake; and maximizing use of the mother’s own breast milk,” says Michelande Ridoré, MS, a Children’s NICU quality-improvement lead who will present the group’s findings during the Virginia Neonatal Nutrition Association conference this fall. “We took nothing for granted: We reeducated everyone in the NICU about the importance of the standardized feeding protocol. We shared information about whether infants were attaining growth targets during daily rounds. And we used an infographic to help nursing moms increase the available supply of breastmilk,” Ridoré says. On top of other challenges, very low birth weight preterm infants are born very lean, with minimal muscle. During the third trimester, pregnant women pass on a host of essential nutrients and proteins to help satisfy the needs of the fetus’ developing muscles, bones and brain. “Because preterm infants miss out on that period in utero, we add fortification to provide preemies with extra protein, phosphorus, calcium and zinc they otherwise would have received from mom in the womb,” says Victoria Catalano, RDN, LD, CNSC, CLC, a pediatric clinical dietitian in Children’s NICU and study co-author. Babies’ linear growth is closely related to neurocognitive development, Catalano says. A dedicated R.N. is assigned to length boards for Children’s highest-risk newborns to ensure consistency in measurements. Infants who were admitted within the first seven days of life and weighed less than 1,500 grams were included in the study. At the beginning of the quality-improvement project, the infants’ mean delta Z-score for weight was -1.8. By December 2018, that had improved to -1.3. And the number of lactation consultation ordered weekly increased from 1.1 to four. “We saw marked improvement in micro preemies’ nutritional status as we reduced the degree of variation in nutrition practices,” says Mary Revenis, M.D., NICU medical lead on nutrition and senior author for the research. “Our goal was to increase mean delta Z-scores even more. To that end, we will continue to test other key drivers for improved weight gain, including zinc supplementation, updating infants’ growth trajectories in the electronic medical record and advocating for expanded use of birth mothers’ breast milk,” Dr. Revenis says. In addition to Ridoré, Catalano and Dr. Revenis, study co-authors include Caitlin Forsythe MS, BSN, RNC-NIC, lead author; Rebecca Vander Veer RD, LD, CNSC, CLC, pediatric dietitian specialist; Erin Fauer RDN, LD, CNSC, CLC, pediatric dietitian specialist; Judith Campbell, RN, IBCLC, NICU lactation consultant; Eresha Bluth MHA; Anna Penn M.D., Ph.D., neonatalogist; and Lamia Soghier M.D., Med., NICU medical unit director.